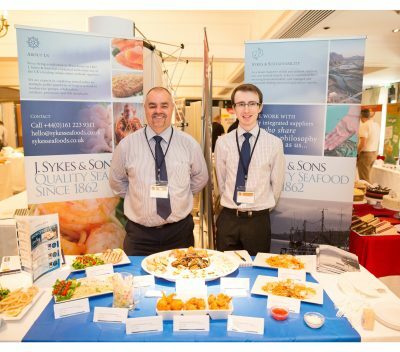 Following the success of the Hong Kong Seafood Expo Asia, two members of the Sykes Wholesale team, Gordon and Anthony, attended the 50th Annual Conference for Sterling Supergroup Ltd.
Sykes were recently awarded the Sterling own label contract for Coldwater Prawns and so the event was a perfect opportunity to meet other members of the Sterling group and to promote the range of Sykes Seafoods. The event took place at Cameron House in Scotland on the shores of loch Lomond and ran across three days. Gordon and Anthony presented a stand during the Trade Exhibition show on the second day, to display Sykes products in all their glory. Although it was Sykes’ first attendance at the show, Anthony and Gordon believe that attending the 50th celebration was a very worthwhile and productive event. Gordon Blackshaw commented “It was a very well organised event, the food and location were fantastic , I feel as a business we really benefitted from the exhibition”. Both Gordon and Anthony were equipped with samples and marketing material alike to ensure all the visitors got a good taste of the Sykes brand. This included a Sykes Seafoods/Sterling brochure to advertise the products on offer, both on the day and going forward. Click here to download the Brochure.